The probable site of Ramakoti Building. If Tamil Nadu ever considered labelling a structure as a monument to South Indian entrepreneurship, this building would have been the first candidate. Sadly, there is not even a trace of where Ramakoti Building once stood. Documents in the High Court of Madras give its address as 47-51 Irusappa Maistry Street, Rattan Bazaar, Madras. That puts it somewhere at the edge of Evening Bazaar Road. There is not even a photograph of the building. Ramakoti Building was part of a large swathe of property owned by that doyen among Indian businessmen – Raja Sir Savalai Ramaswami Mudaliar. His is a rags to riches story that has been well documented in Madras Musings. There is, however, one aspect that deserves highlighting – he was perhaps the first to take over a failing British firm and turn it around. That was D.D. Dymes & Co, of which he was dubash. The company was forced to suspend business in 1904, a year after its Managing Partner, Henry Scott, had been elected Chairman of the Madras Chamber of Commerce, the most powerful trades body of South India. Indians were generally not encouraged to become members, not that there were many who wanted to. But in 1905, the Chamber had to make an exception – it invited Ramaswami Mudaliar to become a member, in recognition of all that he did for Dymes. This was, of course, a small matter for him, for by then he had received the title of Raja, had been knighted and had also served as the first Indian sheriff of Madras. Mudaliar invested his wealth in real estate. Among his holdings was a series of commercial buildings in Rattan Bazaar. One of these was Ramakoti Building. In 1906, when the Arbuthnot Bank collapsed, there was a panic reaction that resulted in confidence in British-run banking establishments of Madras being at an all-time low. As though in response, several prominent Indians of the city decided to band together and set up a bank – The Indian Bank. Prominent among those taking the lead was vakil, later Judge and later Member, Governor’s Executive Council, V Krishnaswami Iyer. The Bank was formed in March 1907 and opened its doors to the public on August 15, the same year. The first premises were within the offices of the old Parry & Co, the site on which Dare House stands today. Within a short while, however, the bank moved to Ramakoti Building and operated there till 1909. That year, the erstwhile offices of Arbuthnot & Co, at North Beach (now Rajaji) Road, came up for auction and the Indian Bank purchased the building for Rs 1,35,000. It vacated Ramakoti Building thereafter and moved into its new purchase. Many years later, the Bank demolished the old Arbuthnot Building and built a multi-storey structure on the site. 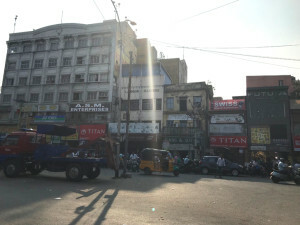 The Bank’s occupying the Ramakoti premises was to prove useful for the South India Chamber of Commerce (SICC), founded in 1909. This was the Indians’ answer to the Madras Chamber and its elitist practices. Such bodies were being set up all over the country, Bengal’s Bharat Chamber of Commerce and Bombay’s Indian Merchants’ Chamber predating the SICC in Madras. Between 1906 and 1909, a number of Indians had got into business – in insurance, car retailing, trading in commodities and retailing piecegoods. All of them were clamouring for a representative body and they did not think the Madras Chamber would do them justice. It is significant that the notice of a meeting to form such a body was printed in Tamil, Telugu and English. The date was May 29, 1909 and the meeting was presided over by Sir Pitty Theagaroya Chetty, later to become a Justice Party leader and also the first Indian President of the Corporation of Madras. The venue was the premises of the Indian Bank at Ramakoti Building. Vidya Sagar Pandya, who fulfilled the equivalent of a Chief Executive at the Indian Bank, became the Secretary of the SICC. This trades body was to operate from there, under the wings of the Indian Bank, till the latter moved to the erstwhile Arbuthnot premises. The SICC too shifted, first to the offices of H.M. Badsha Sahib & Co, North Beach Road. In 1912, it purchased its own office space on the same road and built a handsome Neo-Gothic edifice named the Indian Chamber Buildings. In 1945, the SICC, largely at the behest of K.V.Al.Rm. Alagappa Chettiar, acquired its present premises on the Esplanade. A new building was built here in 1956. Ramakoti Building thereafter became home to several retail outlets. The changing face of Rattan Bazaar saw it becoming a location for several jewellers. Among the most famous was the firm of Bapalal’s. They moved into Ramakoti Building on a long lease in 1938. Ramaswami Mudaliar having passed away in 1911, the premises were inherited by Ramakrishna Mudaliar, adopted son of the former. This lease proved contentious with Mudaliar and Bapalal repeatedly taking the matter to court from 1949 onwards. Judgements were pronounced in 1982! In the interim, the building had changed hands. Its subsequent fate is not known. It may be one of the many buildings that still stand on Rattan Bazaar, its façade completely altered. But in its time it had played home to a pioneering bank “founded for and by natives” and a trade body that represented Indian business interests.